The Kershaw Zing Orange model 1735OR is just what is says. 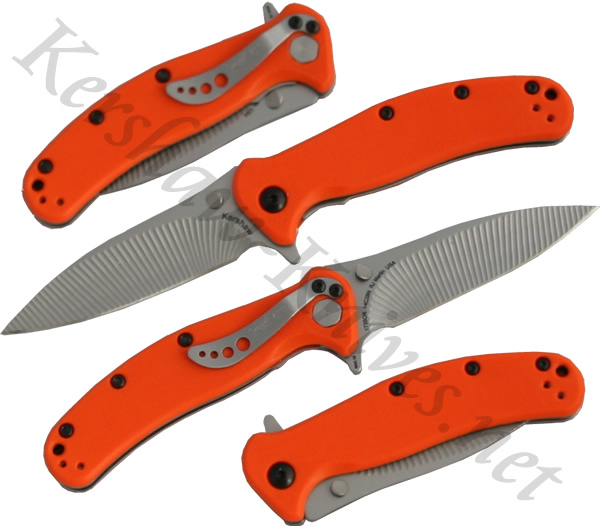 This knife has a bright orange polyimide handle that is great for hunting, safety or rescue. The blade is made of high quality Sandvik 14C82N stainless steel with a nice machine groove striated pattern. The blade is deployed by either the thumbstuds or the flipper on the back. The blade is held in place and released with the liner lock integrated in the handle.